Apr. 12 (NBD) -- Sitting under an incandescent lamp, Wang Jinbo, with one hand holding a graver, was carefully engraving an ancient painting on a black pottery embryo. Behind him was a pile of ceramic embryos waiting to be fired. He was so keen and neat in his work that you wouldn't believe it was more than one year since the last time he engraved. In October 2017, the environmental protection bureau of Jiaozuo city, central China's Henan, began receiving letters complaining about the environmental pollution issue of Penyao village, which is one of China's four largest black pottery production bases, along with Shandong's Rizhao, Shanxi's Qinyuan, and Hebei's Guantao. Some black pottery factories, which clearly know the industry is unfriendly to the environment, rescheduled the firing process to the night and continued to emit poisonous black smoke to the sky under the cover of darkness, the complaint letters claimed. This came after Qinyang city's announcement of a plan to invest 130 million yuan (19.3 million U.S. dollars) to turn the Penyao village into a characteristic town of black pottery in 2017. 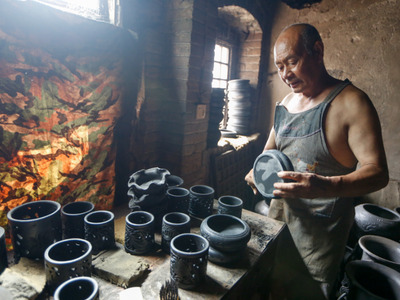 Boasting a profound history and delicate craftsmanship, Penyao black pottery was listed as intangible cultural heritage of Henan province in June 2009. In the Tang dynasty, Penyao black pottery was picked as articles of tribute, and was among exhibits at the imperial palace and the Summer Palace in the Ming and Qing dynasties. Following continuous complaints, all black pottery workshops were ordered to halt production and also promised not to resume production until the install pollution prevention and control facilities. Industry practitioners explained the pollution is caused by the traditional production process which uses wood in the firing process. Some said facing increasing environmental pressure, they had tried to replace wood with coal or natural gas but all attempts failed to produce the desired pottery. The black pottery industry is not the only intangible cultural heritage that came under fire over environmental pollution. Before this, bamboo paper of Zhejiang's Tang'ao, writing and painting paper of Sichuan's Jiajiang, and colored glaze of Beijing's Mentougou also encountered such criticism. How to strike a balance between cultural heritage protection and environmental protection tests the wisdom of local governments. To date, the first phase of the Penyao town of black pottery has been completed, consisting of a cave house exhibition center, a pottery-making exhibition hall, a museum and supportive facilities.